Pristine Inspections & Testing offers thorough home inspection and radon testing services in most of Central Illinois. Radon can enter your home through cracks in floors, walls or ceilings, construction joints, or the water supply, as well as through gaps around service pipes and in suspended floors. You cannot see, smell, or taste radon, but it could be a major problem in your home. By breathing radon-containing air, you increase your risk of lung cancer. In fact, the Surgeon General has warned that radon is the second leading cause of lung cancer. For more information, view the EPA publication “A Citizens Guide to Radon“. You should test for radon. Testing is the only way to find out about your home’s radon level. The EPA and the Surgeon General recommend radon gas testing for all homes. Contact us today to schedule a radon testing appointment for your home. You cannot see radon and you cannot smell it or taste it, but it may be a problem in your home. This is because when you breathe air-containing radon, you increase your risk of getting lung cancer. In fact, the Surgeon General has warned that radon is the second leading cause of lung cancer. For more information, view the EPA publication “A Citizens Guide to Radon“. Testing is the only way to find out about your home’s radon level. The EPA and the Surgeon General recommend radon gas testing for all homes. EPA recommends that you obtain the radon level in the home you are considering buying. An EPA publication “The Home Buyer’s and Seller’s Guide” is a very detailed and informative resource on radon. EPA also recommends that you use a certified or state licensed radon tester to perform the test. If elevated levels are found, it is recommended that these levels be reduced. In most cases, a professional can accomplish this at reasonable cost. There is no reason to fear radon… simply have a test performed to find out if radon is present in your home. 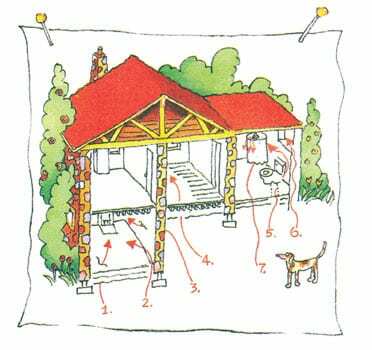 It the test reveals an elevated level of radon, a mitigation system can easily be installed and will reduce the radon to a harmless level. Governor Urges People to Test Homes — January 7, 2009. News Gazette Article, A Worthy Test — December 10, 2006. How can Pristine Inspections & Testing help? 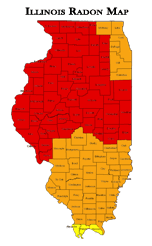 Pristine Inspections & Testing offers radon testing for Champaign, Urbana, Mahomet and neighboring IL counties using state-of-the-art Radalink AirCat monitors. In fact, it’s been engineered to be the MOST sensitive, reliable, and accurate monitor ever. These high-tech units use sophisticated technology that eliminates the high or low bias of most passive type measuring devices – the kind you purchase at the hardware store, home center, etc. The monitor will take hourly readings of Barometric pressure, temperature, and relative humidity. The hourly readings and tamper deterrents eliminate false accusations of human interference that can easily occur with other test devices. The test can run from the state required minimum of 48 hours up to 132 hours (5 1/2 days). 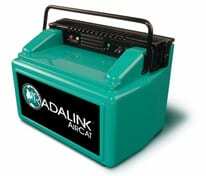 The detailed report is emailed to you and Pristine Inspections & Testing within one hour after the data is transmitted to Radalink’s central analysis facility. No delayed test results! On top of the radon testing we provide we also offer Champaign, IL residential home inspection and new home inspection. You’ll save yourself money in the long run with an inspection.